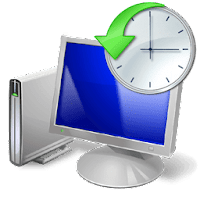 Restore Point Creator is easy to use utility that allows you to quickly and easily create and manage system restore points, all from a free simple program. No more drilling through multiple menus in Windows just to create a System Restore Point, now all you have to do is run this program and that’s it. Plus, for users of Windows 7 and Windows 8, creating System Restore Points is even quicker and easier with this program. Just pin this program to the Taskbar and you have the ability to quickly create System Restore Points using one of the two pinned Tasks (“Create System Checkpoint” and “Create Custom Named”) that the program creates. It’s that simple. Restore Point Creator Version 4.1 Build 5, is the last version of System Restore Point Creator that is compatible with Windows XP. Any future versions of System Restore Point Creator will not run on Windows XP. Windows XP users will not receive any new updates. If you want to continue using this tool and get the support you must update your system to Windows Vista (or newer). Create Custom Named — Asks you what you want your System Restore Point to be named and then creates one based upon what you inputted. Patched a number of possible Null Reference Exceptions in the WMI code. Thanks goes out to "jenn" for reporting this issue to me. Disclaimer: Direct downloads for the lastest version of Restore Point Creator 6.4.1 are provided by the official software's author, we can't guarantee safety, availability or download speed. Moreover, we don't and we won't provide any pirated/illegal versions or tools. We recommend you to avoid it as these methods can harm your device. If you like the software, buy it to support the developers. (We provide software discounts for many worldwide brands).